Manufacturing jobs are waning. In many emerging market and developing economies, workers are shifting from agriculture to services, bypassing the manufacturing sector. In advanced economies, the rise in service sector employment typically reflects the outright disappearance of manufacturing jobs. The decline in manufacturing jobs is often met with anxiety. People are concerned that a smaller manufacturing sector implies slower economic growth and a scarcity of well-paying jobs for low- and middle-skilled workers – contributing to worsening inequality. In Chapter 3 of the April 2018 World Economic Outlook, we revisit the evidence supporting those beliefs and find that the declining share of manufacturing jobs need not hurt growth or raise inequality, provided the right policies are in place. Shifts in economic activity are part of a natural process of “structural transformation.” As people get richer, they consume more services – such as health and financial services. Technological advances also lead to sizable labor savings, especially in manufacturing. Our study provides novel evidence of how a stronger expansion of service rather than manufacturing jobs in emerging market and developing economies may affect their ability to catch up with advanced economy income levels. Using data for a large number of countries over the past five decades, we document that some service sectors are very similar to manufacturing in terms of levels, growth rates, and convergence of productivity (output per worker). Some market service sectors – such as transport, telecommunications, and financial and business services – have higher levels and growth rates of output per worker than manufacturing. 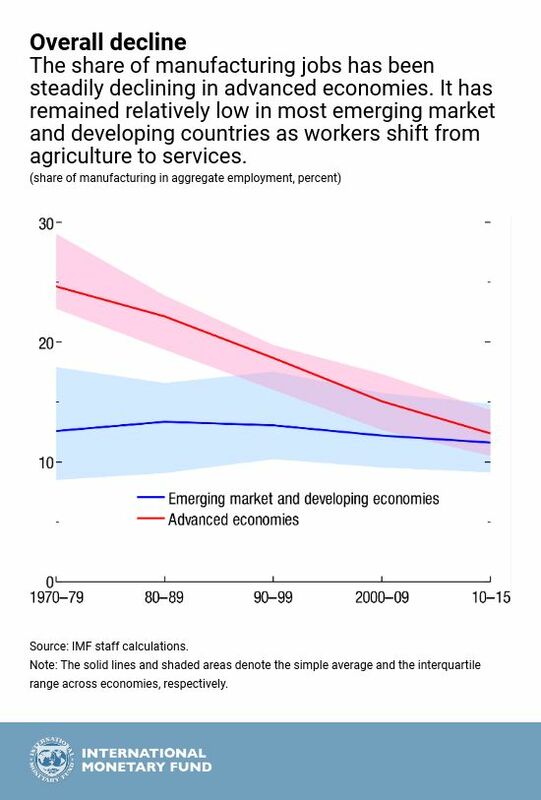 Moreover – just as in manufacturing – labor productivity in several service sectors tends to converge to the global frontier: that is, it grows faster where it is relatively low, allowing countries with low initial productivity levels to catch up toward those with higher levels. EC International Economic Week In Review: Why Are We Growing So Slowly?